In my very earliest days, I was a sperm. At least this is what I’ve been told. I can’t say for certain, because I don’t remember being a sperm, and it certainly seems like the kind of thing that would stick in the mind. More unbelievable is the idea that I was one of about a quarter-billion sperm, all darting and wriggling in a frantic attempt to reach a single egg. This is the only part that helps me understand why I have no memory of the whole episode. I don’t like crowds, especially in confined spaces, or where there might be a lot of splashing involved. To this day, I avoid small elevators and public swimming pools. Plus, the thought that I could have out-maneuvered so many other competitors is hard to grasp. Beating out a quarter-billion opponents would be like going on The Dating Game and being chosen by the bachelorette over the entire male population of North America. I never even won at board games like Candy Land or Chutes and Ladders, and those were usually against other five-year-olds. So how did I manage to break through? I had no advantage over the others. I assume I was just another oval head and long tail. What I could’ve used was elbows. I have them now, of course, but all they seem good for is closing the car door when I’m carrying a lot of bags. They also come in handy when I get a sudden urge to take an extremely sensitive body part and crack it against a sharp edge or blunt object. But where were they when I needed them? With elbows, I might have forced my way through that crowd of sperm in record time. And maybe I would have had more energy to do with the egg whatever it was we ended up doing. I’m not sure how true that is, either. For all I know, sperm have no interest in getting to the egg. Maybe they’re just happy to be out, and aren’t looking for any kind of commitment. It’s even possible that it was the other sperm who bumped me into the egg. I seem to recall hearing muffled laughter, and then a kind of sizzling sound and sparkly things flying around. But as I said, my memory of the actual event is fuzzy. Either way, there must have been a great deal of pushing and shoving, and frankly, I find that image a little disappointing. Is this really how a human life begins? As a microscopic game of musical chairs? That doesn’t make me feel amazing. It makes me feel that I just happened to be in the right millimeter at the right millisecond. And if there was some force guiding me into existence — if I was meant to be here — then why involve all those other sperm? Why get their hopes up when they never had a chance? Most of all, where is the grace? And the elegance? I watch flocks of birds and schools of fish — thousands of individual creatures — moving together in synchronized beauty. I see hundreds of sparrows perched on a telephone wire, lined up and evenly spaced. Imagine humans trying to do that. We can’t seem to attend a peace rally or get ourselves inside a Wal-Mart on the day after Thanksgiving without someone being trampled to death. Watch drivers approaching a traffic circle, and you’ll see more lurching, hesitating, and second-guessing than any starling or cod has ever experienced. The explanation, I suppose, has something to do with our tendency to compete, while at the same time seeking to avoid too much close contact. As a result, we climb over each other to be the first ones into the movie theater. But once inside, we spread out, careful to leave at least one empty seat between ours and the stranger who’s already stuffing fistfuls of popcorn into his mouth. What does all of this have to do with sperm? I don’t know. Maybe our behavior can be traced back to what took place in that bustling corner of the Fallopian tube. In order to get here at all, I probably had to be somewhat aggressive and opportunistic. And yet, that drive to propel everyone out of my way is gone. I sometimes find myself standing in the middle of a long line, and as soon as a new cashier opens up, somebody three or four places behind me rushes over to be the first one served. I’d never do that. When two lanes of traffic are merging into one, there are always several cars that go right to the front and then cut in, rather than wait their turn. No matter how hurried I feel, I merge patiently and politely. If another customer and I are about to enter the bank at the same time, I always hold the door for the other person, even though I know there’s a good chance I’ll end up waiting behind them for fifteen minutes while they make changes to their checking account and pay all of their monthly bills with rolls of nickels. What if I had behaved this way in my days as a sperm? I could have turned to the guy next to me and said, “Oh, no, after you. I insist.” Then where would I be? There’s a lesson in here somewhere, and I’m still fumbling around for it. Maybe it’s that there’s a lot to be said for cooperation and sacrifice, but every once in a while we have to do what’s best for us. Even in a huge crowd, blending in may not be such a great idea, and self-interest isn’t necessarily the same as selfishness. Remaining invisible could be the first step toward non-existence. Now that we’re here, it’s hard to even conceive of that. ← Awards. And a few things that aren’t bothering me anymore, much. Thank you, Michelle. That’s kind of you to say. Thank goodness for Michelle. I was feeling a little awkward being the first one here. Chances are by the time I get done letting you know how much I enjoyed this post, several more bloggers will have made their way to your comments. Turns out you were once an egg as well. That’s okay, WW — I felt a little awkward writing this post. And when I began, that thought occurred to me, that I was also once an egg. Somehow I lost track of it very soon afterward. Maybe the egg is Part Two? The topics you find to write about never cease to amaze me. I found myself simultaneously laughing my a** off at the mind picture and questioning the 3 little million to one’s upstairs asleep in their beds. Thanks! Perplexing to say the least, or the most, but my heart is going out to poor old Ernie. Or at least it will once I stop laughing! It is pretty perplexing, isn’t it? How did we all get here? Thanks for the comment, Patti. Love the murmurations. They are fabulously magical. No, you’re right: men do forget that they also came from the egg. See my reply to WorryWarts above. I may need to do a sequel. Meanwhile, thank you for the feedback, Anna. First of all – no one wins at Chutes and Ladders or Candyland. Well, maybe there is a winner in Candyland, but not Chutes and Ladders. You think the game is almost over, and wham – you get hit with the long slide that takes you nearly back to the beginning. “That’s OK, you say to yourself. The kid will win.” Then – wham! The kid gets caught on the slide, too. Noooooo! We’ve been playing for over an hour!!! Hmmm… I think I got sidetracked. I chuckled at the thought of folks spreading out as much as possible in theaters. It’s true. We do. Yet, we race for the door and stuff ourselves through in a bunch. So interesting, Charles. There is a lesson amidst the swarming … I’ll fumble with it a little more, too. Okay, I feel a little better about Chutes and Ladders. But I’ve also never won a game of Monopoly. Not ever. When I watch that video of the birds, I don’t even know what I’m seeing. Beautifully written, Charles. I’ve missed your posts. I like the concept that, long before conscious thought, we all journeyed through our own, unique environments to become who we are. That’s another interesting thought, Stacie — we were once single cells without conscious thought. It seems impossible, doesn’t it? Where do you come up with this stuff? In traffic waiting to patiently merge? 🙂 I hadn’t really thought about sperm competition before, but honestly, it is amazing. A quarter of a billionth chance and here we all are. That explains why I don’t win the lottery. I already won once 🙂 the chances of two wins are astronomical. As a non-competetive, non-agressive person myself, I feel the lines between self-interest and selfishness can get blurry, too. I suppose wondering about it negates selfishness all on it’s own. Wonderful piece, Charles! Keep ’em coming! Just a few weeks ago, I was wondering about all of those other sperm cells, and I realized that any one of them could have nudged me right out of existence. And, of course, it was the weirdness of the thought that stuck with me. I think the odds of winning the lottery are actually better, but anyone who does win would have had to come out on top in that first crazy lottery, wouldn’t they? Thanks, as always, for the nice comment, Jessica. I’m glad to know you’ve recovered from the hand injury, and have resumed your weekly column. I love the way you have done the cartoon, brilliant. A great post, it really does make you think, but I couldn’t help but smile, you have said it all very well. You’re the master of posting amazing videos, Mags. I’ve found things on your blog I would have never seen otherwise. Loved this post. Thank you for a different look at some of what has made us the way we are … jostling for attention, dislike of crowded rooms etc. Had a good chuckle but it did make me wonder a few things. I’m glad to hear that, fantailnz. Laughter and wonder are two of the best things in life. Everyone assumes the sperm are trying to get to the egg, but who knows? Your post had me wondering, then I saw Jessica’s comment, …where do you come up with this stuff? In traffic waiting to patiently merge?… And when, while searching for work?? ….and worrywarts, ..turns out you were once an egg as well. I’m not sure where we all come up with the things we wonder about, but I’m glad we do. Thanks for the comment, AIT. It’s always great to hear from you. “my memory of the actual event is fuzzy” – hilarious! I am always amazed how skillfully you strike the balance between making me chuckle (the cartoon is a good one, too) and think. I tend to reside at the polite end of the spectrum, too, but merging lanes always make me furious about the people merging too soon, thus creating a longer queue and usually blocking the next intersection/traffic circle in the process. Does that make me a competitive bonehead? So drivers in Europe have the same annoying habits. I guess I’m glad to hear that. Thanks, Sandra. I also love the cartoon, and the videos. Although, the videos make me anxious, and I think that has something to do with my claustrophobia and worrying about the animal in the middle of those swarms. This is a Play On Words Bonanza, Charles, and I love that, as well, naturally! In fact, I got ahead of myself and thought you wrote “In order to get here at all, I probably had to be somewhat eggressive.” Being that I’m Amiable Amiable, I have absolutely no clue how I beat out all of the competitors. It really doesn’t make any sense at all. But I’m glad I did because I’m here and can enjoy reading your hilarious posts! I imagine all of your competitors were also Amiable Amiable, and it was the most polite conception in history. Still, I’m glad you’re the one who made it — because you’re the true AA. I didn’t think you could top that cartoon, but you did, and then some. Simply brilliant as usual, Charles. I will forever think of sperm with elbows now. There are just too many lines in this that made me laugh and think. A great combination! I certainly hope you are going to publish a volume two of Who Knew? and include this post. I don’t know about a second book, Darla, but enough people have reminded me about having once been an egg that I’m feeling a need to write a sequel to this post. Meanwhile, thank you, as always, for your kind words and support. Thanks, PC. I appreciate the comment. I think the lesson is that a higher power intended for you, with all your peculiarities and insights and brilliance, to win the race and become the wonderful person you are, Charles. We’re all lucky that, at least once in your life, you kicked it into gear and made it there before the others. In one concise paragraph, you’ve boiled it down to the essential questions, SDS: Is it a higher power or plain luck? An external intention or internal determination? I thought I was finished wondering about this for a little while, but you’ve got me thinking again. Such a wise soul wrapped in the guise of the hilarious. Thanks again for the laugh,…..it was welcome! Love the Elmer Fudd-esque title! Made me roar. You now know that you were also an egg, so let me just say great post! The last paragraph should be in neon lights. I hadn’t thought of Elmer Fudd in this context, but now that you mention it, I can’t get his voice out of my head. A Pancake!! LOL!! I just love the way your mind works. If you had elbows you might have banged them, stopped for a second in pain, and lost. I’m thinking that was your secret. Those videos are amazing. I always wonder how they avoid colliding and why we don’t see them stunned and falling from the sky. It is like a perfectly choreographed dance that is mesmerizing. It is mesmerizing, isn’t it? They seem to be guided by something completely outside of themselves. Love this! I hate crowds too, but you did make me think of Black Friday, and how all politeness goes completely out the window when the toy my kid wants THE MOST is the last one on the shelf. I guess that’s when “my inner sperm” (ok, that was strange) shows itself. Oh, and as someone else mentioned – you are the egg too:) Did I just make some weird Beatles reference there? Hmmmmm…. I suppose we all act differently when our motivation for something gets revved up. If we could just draw the line at not hurting each other, that would help. Thanks for the comment, Ashley. It’s good to hear from you. I love this post… What curious things you think about, Charles. Do they wake you in the middle of the night? About the chutes and ladders. Would this be the same as the English snakes and ladders? I’ve always wondered why anyone would slide down a snake, but I understand why someone would slide down a chute. Much more logical, even if – as Lenore Diane says – you never win the game anyway! I seem to remember that they changed the name from Chutes to Snakes and Ladders, and I wondered about it, too. Chutes are much more fun. Just last week I managed to win my first game of Candy Land against a 5 year old. Ok, OK, she was only three – but she’s mature for three. or… not… I’m just supposing. It’s an interesting thought, though, that the bully sperm don’t survive to become bully people. You’re only half sperm, Charles! You’re also half egg, and from the way you describe yourself – patiently waiting while everyone rushes around you – you definitely sound more egglike than spermlike. Great writing, as always. Thanks, Cathleen. You inspired me to write a follow-up post, in which I address my half-egg origins. I am definitely one of the idiots who sprints over to get in the new cashier’s line, although I really sincerely try not to be a jerk behind the wheel … but I do love the idea of you sitting in your car patiently letting other people in, ruminating, and coming up with all these brilliant, offbeat queries of yours! Lovely juxtaposition between the competition of natural selection and cooperation — which is looking very much like what may be required if we’re to survive. THANKS for the beautiful videos at the end … that totally made my day!!! Thank you, Betty. It’s always a confidence boost when I get such a nice comment from one of my favorite writers. 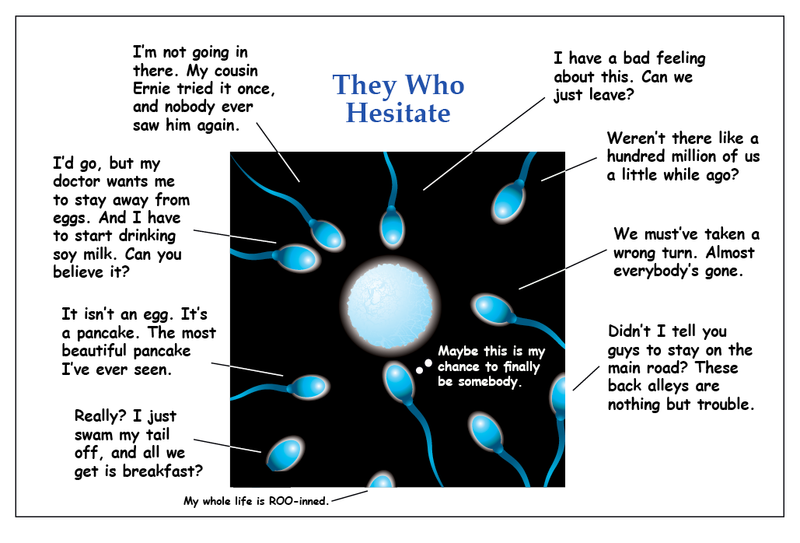 “It’s even possible that it was the other sperm who bumped me into the egg.” -hysterical! Wouldn’t it be amazing if we could remember? Weird, but amazing. Once I got past that, the rest was a delightful read, as usual. I no longer have a video camera or a microscope, and I don’t know how to upload videos to YouTube. Plus, I’m an introvert. Animal instincts……survival of the fittest….Can’t stand the heat get out of the womb..
Not sure EGGsactly Y the reason…..maybe something X-tra added….. I hate that your comments are better than my posts. I’ll sell them to you..cheap. Haven’t read through all the comments, but I was immediately struck by the fact that one million sperm are needed because they don’t know where they’re going and refuse to stop and ask for directions. Hence the need for only one or two eggs. BTW, it was very sweet of you to produced a specimen, just to share with us. They are very agile, rather cute, and only a few of them seemed to be running in confused circles, bumping frantically into each other. Ha! I love this comment! Five or six people have reminded me that I was also once an egg, so let me remind you that half of those sperm cells carry the X chromosome. And I didn’t produce a specimen; I produced a link. Thanks for the comment, Sybil. I’m glad you think so, AIT. Thanks. Why, just this afternoon a flock of starlings descended onto my lawn, then the neighbor’s rooftop, morphed onto the powerline across the street, all the while my cat’s whiskers chattered uncontrollably! What brilliant wit you possess, Charles. You had me laughing over your elbows and then positively rolling on the floor over Walmart shoppers. There are so many amazing sights in nature, Linda, but the way thousands of birds can move together in constantly changing patterns has to be one of the most intriguing. And I bet your cat would agree. Thanks for the chuckles and the great videos. I love the murmuration – especially the young ladies who are giggling over their encounter with the starlings. Maybe the motion of the starlings is just what happens when everyone is polite at the same time. Charles, you creative and successful contact! I watched those videos and did not think of sperm. You did. There’s the difference between having imagination turned on or not! Well done. Thanks for this great writing. I also thought of ants, Amy. I used to think of them as highly organized, and they are, but watch individual ants around an anthill and you’ll see a lot of aimless wandering. That video was so beautiful. I cried. I really did. That was the song they played as I walked down the ailse. Also a string quartet. Thank you for sharing. A wonderful piece. You always inspire me. It’s breathtaking, isn’t it, to watch living things display that kind of harmony? Thanks for the nice words, madamfickle. I think I scared myself with this one, Mitch. You’re right. I’m not sure Fallopian tubes even have corners. I love the contrast between you as the competitive sperm and you as a kindly man being cut off in traffic. If someone is going to stick their neck out on the line and “be selfish”, risk the comfort of invisibility and be called self-seeking, I would like it to be a highly evolved person like yourself who is speaking for the many who have yet to find their voice. Thanks, Bryon. I really appreciate your encouragement. I don’t know why I am crying but I am.. This was excellent. Thank you, Jenn. I hope things are going well for you. What a thoughtful and thought-provoking post. Hello! I am (((me))) Rosie because one particular sperm with two particular X’s won the race 🙂 Wow! I love both the videos. Amazing how the fish stay in a close circle. Maybe the birds flying over the California freeways wonder how all those cars manage to move together as they do. I guess we’ll never know. Maybe it’s the writer in me who sees the similarity to getting an agent – there seems to be so few of them and so many of us racing to crack the shell and get our work through ahead of all the others. You also beat many of us to the publication egg as well Charles, so I’m thinking you are a tougher competitor than you want to acknowledge. Bravo! The picture is hilarious and very true words. Good thoughts! I once read in a fountainhead speech that we need to be motivated by our own truths and what we seek. Perhaps its a balance between cooperating with others and our selfish pursuits of truths. It’s difficult to even define selfishness. The most noble and generous person must feel a sense of satisfaction — does that make the act a selfish one? I think you’re right, though. The trick is to find the right balance between cooperation and self-interest. I think that’s the best part of the movie. Thanks for sending it, Bekki. Ps. You know you want to hear it. It’s fascinating how you compare the journey of the victorious sperm to a game of musical chairs. I’ve never thought of it that way; nor have I considered myself once a sperm among a half-billion. The lesson, I think, is that our very existence is quite complex and is a balancing act; a dynamic, case-to-case scenario. P.S. I got your book but I’m yet to start reading it. 🙂 I did browse through the pages and it’s got an old-school feel to it with the black and white pictures. Thanks for buying the book, Nel. I was going to do the cartoons in color, but that would have driven up the price well beyond what anyone would have paid for it. Thank you for the comment, Yulia. It’s always nice to hear from you. I’ve looked and looked, in your post and in the comments – it HAS to be there, but I can’t find it. If it isn’t there – well, it’s in your subconscious. I even brought you the Ezio Pinza version, just for the heck of it. That title is one of the best puns ever! I saw South Pacific in high school and didn’t really appreciate it. Thanks for sending this link, Linda. I’m glad you liked the title. This is a really intriguing article Charles. I’m supportive of what you say. Like you, I am not a fan of massive crowds. It is interesting that people will rush in to get their place when they know that opportunity is brought to them. It’s very good of you to be patient and let things happen, whether or not it means you wait more in those examples you used. I hope we all don’t result to being invisible!! I don’t think anyone is really invisible, Kathleen, as long as we keep paying attention to each other. Thank you for the comment. Whenever I think about such things I always reflect on how inefficient life is. Whether you believe in evolution (“after all these years, how could a process as basic as the beginning of a new life be so inefficient”) or in a creator God (“why would an all-powerful, all-knowing God create such an inefficient system”), it just doesn’t make any sense. Maybe nature doesn’t share our need for things to make sense. I’m still too busy laughing helplessly at the title of this post to fully appreciate the greatness of the post itself. Charles, you have the most splendid mind. Thank you for inflicting it upon the rest of us. Thank you for your kind words, Ailsa. It’s always great to hear from you. Of course we were the ones to reach the goal. Otherwise, we wouldn’t be here to listen to the motivational speech. Silly, isn’t it? P.S. is it all right if that’s all I can express right now? Anything you express is all right with me, Priya. Thank you. I am just visiting your site for the first time and your blogging grabbed me, hung on tight and made my eyes stick to the words like glue as I laughed my way through your mind…wow! You are such an incredible writer and i can’t wait to read more! You had me with the opening “cartoon.” I can’t say that I’ve ever thought about that moment of conception (I guess being the egg and just waiting around for the “right” one to slip through the crowd is much less stressful), but I’ll be thinking about it now! This made me chuckle, but it also made me ponder … thank you for another exceptional piece of writing! I was surprised by how little I’d ever thought about that most important moment, too. And then when I try to think about it, the whole thing is so fuzzy and confusing. I love the video clips, its like they’re dancing in the same harmony. Wonderin’ why? This is one of amazing creations of God. Sorry I missed your comment until now. But even two months later, I still appreciate it. A few years ago (many years ago) there was a public transport strike of tram drivers and conductors in my city. Watching a hundred odd bodies trying to push their way into a 40 body bus was some experience. Your article has really cleared things up for me. Thanks. I’ve been to Tokyo, so I know exactly what you’re describing.